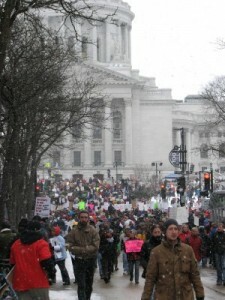 Wanted to post some pictures we took at the Madison rally on Saturday, February 26th. We had a high of fifteen degrees Celsius that day; snow was more like ice flakes than anything else. The rally began with The Star Spangled Banner. Speeches were given by: the leader of the Wisconsin NAACP, an Episcopalian minister representing over 200 clergy from different faiths statewide, Wisconsin native actor Bradley Whitford along with Robert Newman and Gabrielle Carteris representing AFTRA, SGA and the Writer’s Guild, several nurses, teachers and professors, Jeff Skiles the co-pilot from the Miracle on the Hudson rescue last year, our state’s fire chief, etc. 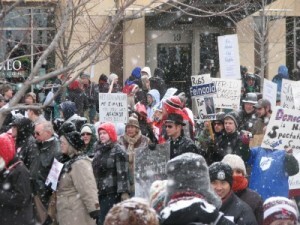 The protests began almost two weeks ago and Saturday’s rally was an estimated crowd of 70,000 plus. To date, there have been no arrests. 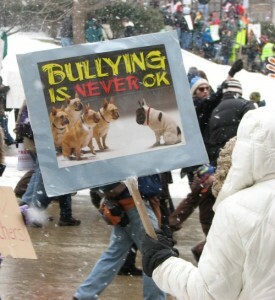 Since I do not want to turn my blog into a forum for political debate, I am closing comments. 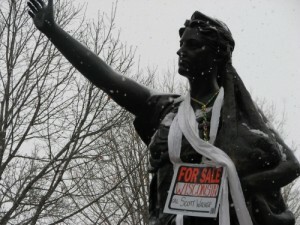 I just wanted to share these photos with you, since these historic and prolonged protests are happening in my town. I’m really excited! The New Hero anthology Table of Contents has been announced and I’m in it!. You may recall me posting about my short story and Stone Skin Press a while back where I talked about “Fangs and Formaldehyde,” about an iconic vampire. One of the inspirations for this particular story was Twilight. No seriously, it really was. To me, many modern-day vampires have had their fangs removed. Even though they prey on humans to survive and have traditionally been monstrous creatures, they’ve been de-fanged for romantic plot purposes. Mind you, I have absolutely no problem with romance authors or readers. Romance is a popular genre and it does have its place in our wide, wide world of fiction. These authors work just as hard as anyone else does to tell a good story. When I was working on my story, I wanted my modern vampires needed to have a legitimate reason why they weren’t monstrous creatures that wasn’t just: “Because otherwise people will hunt us.” This was a lot of fun to worldbuild because it was a challenge. Was I able to do something unique? Well, you can be the judge of that. Standing alongside me are several other fine authors including Rich Dansky, Kyla Ward. Ed Greenwood and my friend Maurice Broaddus. After you check it out, be sure to read Diagramming the New Hero where the editor, Robin Laws, explains how he put the order together. I hope you visit Stone Skin Press or watch my blog for more updates. This’ll be a fun anthology to read. If you follow my work, this particular short story will be unusual for you to read because it’s a lot darker and grittier than my other stories. When I was figuring out an angle for this tale, I built a world where the zombie invasion wasn’t completely devastating. Then, I gave my zombies some unique attributes that supported the main character’s story. Told from a cop’s perspective, you’ll find out why he lives day to day, hanging on to whatever hope he can find. I hope you consider picking up a copy of The Zombie Feed Vol. 1. Not only will you find out why my story is entitled “Tomorrow’s Precious Lambs,” but you’ll also read other sinister tales by acclaimed authors including Lucien Soulban and B.J. Burrow. 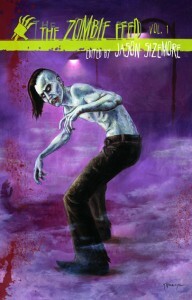 To get your hands on a copy just click on the book cover or pre-order The Zombie Feed Vol. 1 and feed your head! The editor will be signing your copy; several of these writers, including myself, will be happy to sign our stories as well. When I was a kid, I was an avid reader and really enjoyed diving into period fiction. For example, Edgar Allen Poe was my introduction to horror and continues to have an influence on how I feel about, read and write within the genre. For mysteries, on the other hand, Arthur Conan Doyle delighted me with the tales of Sherlock Holmes and his character’s uncanny deductive reasoning. Although I started with Sherlock Holmes, I then went on to read other books in the genre by both male and female authors. Remember Nancy Drew? Encyclopedia Brown? Meg? For me, though, the iconic detective and the cases he had to solve really framed what mysteries were all about — the clues. One of the posts I really liked was his critique of The Musgrave Ritual, where he mentions phrenology and the dreaded butler. This story was one of my favorites as well; it’s interesting to see how stories I enjoy resonate with other readers and why. There are several essays posted already, so if you want to dive in and take a look, be sure to visit his website and read through Tour de Holmes on EddyFate.com. Eddy has also posted links to the public domain e-books on his site, so you can read and comment along with him. Good stuff! I came across this book and website when I was reading the news the other day, and I have to admit I’m really intrigued. In it, the author who is a video game designer, talks about how gaming is good for you. In moderation, of course! 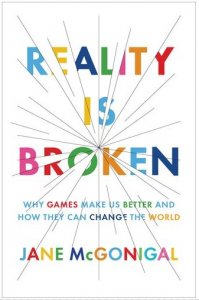 Already Jane McGonigal’s book has been covered by BoingBoing, The Onion and several other places — including TV shows like The Colbert Report. I’m excited to see a book about the benefits of gaming not only getting this much press, but also from a female game designer! Go Jane GO! I love to play and design games. Believe me, I wish I had the mad programming skills to be a video game designer; I’m more old school. I do, however, enjoy playing them. Just finished Dragon Age and am making my way through Final Fantasy XIII for another round before the sequels come out. I also have a Nintendo DS and many board, card and role-playing games with a social feel to them. This is one of the reasons why I love the hobby games industry. It’s not just about designing games or writing for publishers, it’s also about making quality connections with people and having fun. I have many good friends here and several people I’ve written for are also people I’ve rolled dice with. If you come across other books like this, please let me know in the comments below or via Twitter or Facebook. Thanks!